State Treasurer Denise Nappier offered a presentation to the state’s Pension Sustainability Commission outlining the difficulties facing Connecticut’s Teachers’ Retirement System and suggested transferring $3 billion in state assets and bonds to teacher pension fund. That $3 billion includes $1.5 billion in CT Lottery-backed revenue bonds and another $1.5 billion in other state assets. Nappier estimated the move would save Connecticut $441 million per year. Nappier pointed out the state underfunded teacher pensions by $979 million between 1991 and 2005, and then took out a $2 billion pension obligation bond in 2008 in an effort to boost the pension fund. That bill could be substantial. Although the Center for Retirement Studies at Boston College projected the state’s teacher pension payments could spike to $6 billion per year, Nappier says based on past trends, the cost will likely rise to $3.25 billion by 2032. That figure is three times the amount the state currently pays toward the teacher pension system. TRS is currently only 57.7 percent funded with $13 billion in unfunded liabilities, according to the Treasurer. Part of the problem with TRS has to do with previous assumptions that TRS investments will return 8 percent, but the fund has only returned 7 percent on average. The discrepancy between the assumed rate of return — known as a discount rate — and the actual returns means that even when the state is making its full annual required contribution, the state is still underfunding the system. Nappier argued the discount rate should be reduced to 7.5 percent at first and then 7 percent over the long-term. A higher discount rate allows the state to make a smaller yearly contribution to the fund. Reducing the discount rate – while more realistic — requires the state to increase its contribution and increases the unfunded liability. She also recommended paying off the pension obligation bonds in 2026 and then re-amortizing the debt – similar to what Gov. Dannel Malloy did with the State Employee Retirement System in 2017. The re-amortization would lower the annual payment but also stretch out teacher pension debt payments over a longer period of time. The Treasurer’s Office estimated the savings to be $5.1 billion. Gov. Malloy attempted to re-amortize the teacher pension bonds in 2018, but Nappier said that would violate the 2008 bond covenant and ruin Connecticut’s credit rating – which has already been lowered in recent years due to the state’s debt problems. The Pension Sustainability Commission was formed to examine whether the state could sell or transfer state assets in order to help better fund the TRS. The Commission on Economic Growth and Fiscal Stability in 2018 recommended transferring the state lottery system to TRS. The lottery system generates about $330 million annually, which is used to help fund Medicaid, the Department of Education, Libraries and Education Services and debt service. Nappier did not seek re-election as State Treasurer in 2018 and will be replaced by Shawn Wooden, former President of the City Council of Hartford. The perk to work…how easy it is to bash public educators….who start out at a base pay of roughly 35,000….how many pay freezes, they have endured throughout their careers to keep salary steps stagnant with no pay increase. Only after a 15-20 year salary step. increase….they MAY make it to a top step of a state average of about 80,000. Don’t forget about the masters degree investment that a teacher must have. A career of 35 years means that a teacher contributed to their pension on a continual basis. With that pension that is well deserved, teachers are still required to pay an excessive monthly amount for healthcare once retired. Today’s society has it all backwards….pay for those that want to sit home…individuals that have working extremities so they can receive free rent, healthcare, meds, groceries, heat, cell phones, daycare….etc. etc….the list is magnanimous. People love to bash educators…go try it one day….go to college…get the degree…get into the classroom and see if one doesn’t earn every penny….and with those pennies did you think we were just going to have money taken out along with the state, federal tax, health insurance rates, and not get ANY return after 35 years of steady work….honestly…work needs a perk! People don’t have any idea of how bad this is. When you pay a teacher a salary that is similar to a mid manager at UTC(where I worked) with a STEM degree working year round(a teaching degree compared to a STEM at UConn would be like Calhoun’s St Josephs team playing Calhoun’s Conn team) and make it impossible to downsize through tenure even though enrollment is plummeting you would be surprised at results. I know of phys ed and grammar school teachers making 100k, even librarians(openthebooks.com) who will demand 70k pensions. 3000 teachers in Fairfield county make 100k+, and even in Killingly, Waterbury etc 90k is not uncommon. The pension we paid to a teacher at 35 years work retiring last years was 60577 on a salary of $92286 at age 62.7(TRS numbers) which makes every pension the equivalent to a $1,200,000 annuity from mass mutual. Every business nows this so will not expand here without tax breaks to hold them harmless and all have plans to leave when the bill comes due. By the way the TRS says the avg teacher makes 77803 at age 44.7. (does not include pension). Parents should think of this when they buy their Dunkin teacher gift cards this year. Transferring 1.5 billion in CT Lottery-backed revenue bonds and “other state assets” to the TRS system will NOT save CT taxpayers 441 million. It does nothing to change the underlying expenses which are the benefits of the retirees and future benefits of current members of TRS. Transferring a revenue source from the operating budget to the TRS Pension fund just leave a hole in the budget. Transferring a non-revenue asset to the TRS will reduce the “Annual Required Contribution” leads to more underfunding, like the over optimistic discount rate. The real cost of a teacher working 35 years to get a 70% pension is a cost incurred in the 35 years of work, not a cost incurred after retirement. We just pay it out after their working career is over. If in 2010, we had to buy an annuity for each and every active TRS member for the pension they earned that year, the cost would have exceeded the 559 million of Annual Required Contribution. In 2010 there were 51,368 active members averaging 71k per year in salary for a total covered payroll of 3.646 billion. Those 50k teachers just added 2% to their pension benefit. That is 73 million for a year. But, that 73 million additional pension benefit will grow as their salary increases and continue for all of the years of retirement , perhaps 20 – 40 years. It will be increased by COLAs that will offset much of the discount rate. So what is the real cost of the benefits earned by those 50,000 teachers in 2010. Let’s say the average teacher retires at 57 and lives to 87. So the 2% earned in 2010 will increase their pension $1420 per year for 30 years so it is $42,600 in 2010 dollars. Multiply this by 51,368 teachers and you get a cost of 2.2 billion. This far exceeded the ARC of 559. Many people have been stating that these pension problems we created in the past and that none of the problem accumulated in the Malloy years. That is not correct. 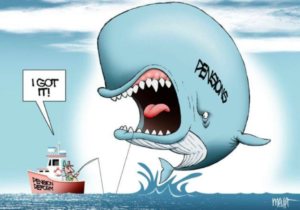 The problem grows every year and our politicians the unions do not want us to understand the true cost of the pensions being earned now.